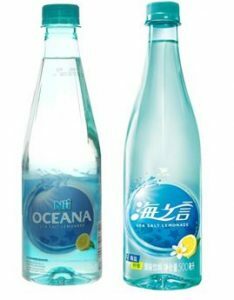 China’s highly successful Haizhiyan Sea Salt Lemon Water (海之言) has been introduced in Indonesia under a new name Nu Oceana. 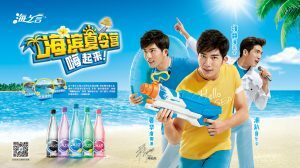 The new Nu Oceana Sea Salt Lemonade was officially launched in April 2016 by PT ABC President, a joint venture between local ABC Central Food and Taiwan’s Uni-President Enterprises Corporation. Uni-President’s local unit in China owns the Haizhiyan brand. Nu Oceana is lauded as the first sea salt drink in Indonesia. In China, sales of the juice-flavoured functional drink Haizhiyan was reported to have reached CNY 1 billion in the first half of 2015. 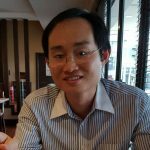 In 2015, the combined sales of Haizhiyan (CNY 1.7 billion) and Classmate Xiaoming RTD tea stood at more than CNY 2.5 billion. Nu Oceana comes in a smaller 460ml bottle whereas Haizhiyan has a larger volume of 500ml. There is currently only one flavour for Nu Oceana. Haizhiyan, launched in 2014, now has five flavours – lemonade, calamansi, blackcurrant, grapefruit and peach. Peach and blackcurrant are the new flavours introduced in early 2016. As the key ingredient is sea salt, the TVCs and print and ads for Haizhiya and Nu Oceana revolve around sea, sun and sand. But Haizhiyan goes one step further by claiming it uses Mediterranean sea salt. The difference is obvious. Mediterranean is more effective in conjuring the image of sea, sun, sand and blue sky for Chinese consumers as well as implying quality (sea salt from the Mediterranean). For Indonesian consumers, there are already living in a tropical country that is hot and sunny. The only thing that turns them on is leaving the congested urban sprawls and pollution and head to the beach for a relaxing vacation with friends and family. Nu Oceana’s “Taste of Summer in a Bottle” tagline sets is apart from Danone’s Mizone and Vit Levite. The ads of Mizone and Vit Levite are usually set in an urban environment addressing the needs of urban dwellers such as uplifting the spirit (Mizone’s Bantu Semangat OK Lagi!) and relaxing (Vit Levite’s Rasakan Ringan). 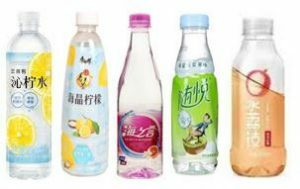 In China, “lightly flavoured” or “near water” drink has become a key category for new product innovation. The popularity of “near water” drink reflects consumer changing preference for natural hydration with low artificial flavour and sweetness. Lightly flavoured drink is characterised by its transparent colour (water like) and its fruit-based flavour. From left to right Suntory Qin Ning Shui (沁柠水), Master Kong Sea Crystal Lemon (海晶柠檬) with sea salt, Uni-President Hai Zhi Yan (海之言) with sea salt, Danone Mizone Sui Yue (随悦) with sea salt and Nongfu Shanquan Water series. In Indonesia, Danone Mizone Fresh’in, debuted in 2014, is the closest equivalent to “near water” drink. The other is Danone’s Vit Levite light fruit-flavoured water, also launched in 2014. Nu Oceana now joins the light fruit-flavoured water bandwagon. The new beverage is positioned as a hydration drink to replace lost fluid and electrolyte and is suitable for every day consumption. 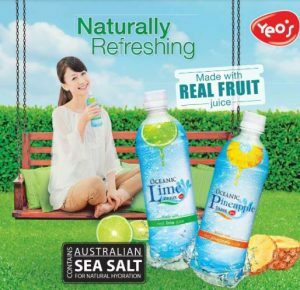 In Singapore, Yeo’s has launched something similar made with real fruit juice and Australian sea salt. With a Nu Oceana making an appearance in Indonesia, would it be time before similar light fruit-flavoured water with salt makes its way to Malaysia.